The West Coast is threatened by tsunamis from far and near, but the biggest threat is a tsunami from a local megathrust earthquake of magnitude 8 and greater. The tsunamis we saw in Sumatra in 2004 and in Japan in 2011 were of that type, created when giant subduction earthquakes push up large areas of the seafloor and launch seismic sea waves in every direction. The entire U.S. West Coast north of Cape Mendocino—Cascadia—is a megathrust zone, and this is where the most serious tsunami preparation is occurring. The Cascadia subduction zone is capable of a magnitude-9 earthquake—the same size as the Sumatra and Japan quakes. Japan, with its elaborate defensive measures, had a death toll less than one-tenth as great as Sumatra, which had almost none. California, Oregon and Washington, the three states of Cascadia, are trying to reach Japan's status in tsunami planning and preparation before our own "Big One" comes. Tsunami planning is a complex task led by government, in concert with scientists and coastal residents. It starts by figuring out what the waves from a giant earthquake would do. Government geologists have prepared tsunami inundation maps (find them here for California, Oregon and Washington). Next comes looking at these maps and figuring out where people should run to reach high ground. Oregon and Washington have done this work and prepared evacuation maps; some California cities have issued them too. Many coastal towns in Cascadia have little or no high ground and would be overrun by a great tsunami. That leads to where we are today in tsunami planning—installing tsunami shelters or "vertical evacuation sites" to save lives in these places. This task goes beyond science, because local governments and citizens must participate in siting, designing and building the shelters. There are hearings, reviews and funding to be arranged. And the people must embrace the shelters, with tsunami drills and long-term support, to make them work. But this essentially political process does need science. This week the U.S. Geological Survey released a new mapping tool, the Pedestrian Evacuation Analyst, to help tsunami shelter planners. 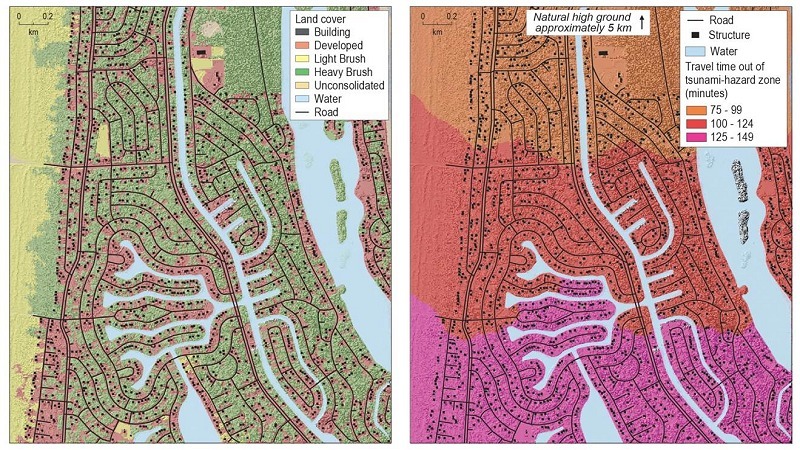 This example for the low-lying town of Ocean Shores, Washington, shows the kind of output it creates. Ocean Shores was a testing ground for the Pedestrian Evacuation Analyst (a case study is reported in the current International Journal of Disaster Risk Reduction). 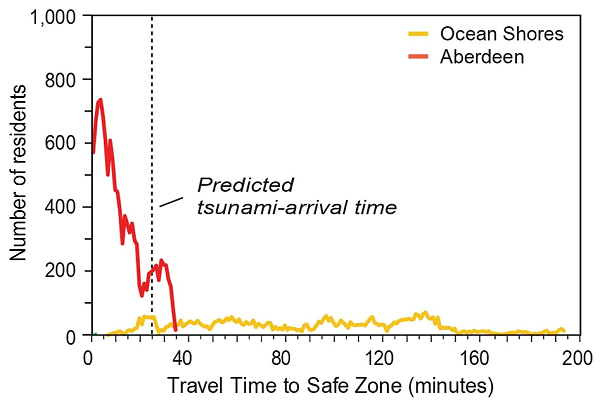 Here's a look at the challenge there, a graph comparing Ocean Shores with nearby Aberdeen. Almost all of Aberdeen is a half-hour's walk from high ground, but in Ocean Shores the residents would reach safety in a hopeless trickle. In Ocean Shores and other places like it, well-placed tsunami shelters are a matter of life and death. This kind of analysis can help state and county regulators set priorities. The tool also helps in picking candidate spots for shelters, in specific neighborhoods. The maps and plans can then be judged realistically by the public, either online or in formal hearings, and sound decisions can be made. The Ocosta School District, on the vulnerable Westport Peninsula in southern Washington, is constructing the first large vertical evacuation tsunami refuge in this country. It's not a dramatic structure, just the roof of the school's gym with four large stairways leading to it, but the refuge will hold over 1000 people—everyone in the school, plus room to spare for local residents—if the worst happens. The school offers another lesson: according to Timothy Walsh of the state's geology agency, previous bond measures to replace the school had failed twice, but after the tsunami shelter was added the bond was approved by 70 to 30 percent. Tsunami preparation is not cheap and not yet deeply engrained in our culture, and the benefits may not be obvious until the day that lives are actually saved.